We’re entrepreneurs. We love what we do — so much so that we hardly feel as if we’re working at all. The thing is, we get so caught up in our passion that we hardly notice time ticking by and we work longer hours than perhaps we should. Not that we choose to. It just happens. The problem is, we’re human and we need to take a break from all this exertion. It’s good for us and it’s good for our business. Don’t be frightened to take time off. You’re entitled to it just as much as everybody else. Think of all those hours you work. So much hard work goes into a business that it’s very easy for work to dominate your life. No one wants that. Not you. Not your family. Not your friends. The more you work, the more you could be hindering your productivity and damaging your health. Longer hours have been linked to increased depression, weight gain, cardiovascular problems and more. What better excuse for annual leave can you need than your health? Put in that holiday request to restore your work-life balance, recharge your batteries and refocus. When you’re in and out of company meetings, visiting clients, pitching for new business, attending conferences and networking, researching new business opportunities — just a few of the many tasks a business owner does — you’re so heavily involved, you can’t see the bigger picture. Yes, you have your balance sheets and company reports, but the chances are you’ll still be somewhere close to the business when you’re reading them, whether you’re in the office or at home. Taking a holiday not only gives you a well-earned rest, but it allows you to step back from the current situation and see how things are really going. You can develop fresh perspectives about the way the business is operating — and return with new ideas to reinvigorate the business if things have slowed down or to prosper even more. It’s up to you to set a suitable tone for the company culture. Don’t let the culture of the business become toxic by never taking any time off. If you don’t take a break, your employees won’t feel they have the right to one. They might even go as far as foregoing their leave days. Request that annual leave of yourself and grant it so that you send out a positive message about work–life balance in the company. Okay, so you’re not picking shares or purchasing a fund, but what you are doing is spending time on your business’s biggest asset: you. Performing at your best means looking after yourself. Time off is an investment in your wellbeing. This goes for weekends as well. Don’t just work seven-hour days constantly. Sooner or later, you’re going to burn out. Don’t think your wellbeing is something you should only think about on holiday either. Exercise and eat well during your working week to stay healthy and fire on all cylinders. When you work long hours, day in, day out, the routine will take its toll on you psychologically. You hardly ever switch off. Having a holiday ahead of you is motivational. You’ll stay focused on what you’ve got to do and cope with your tasks much more easily. The thought of playing tennis somewhere warm and sunny on holiday, for instance, really pushes me on to complete my business duties before I call it a day for a couple of weeks. This is something you can apply in your daily working life, too. Schedule an activity you enjoy for after work and your motivation will be much higher throughout the day. Never feel guilty about having a holiday. In fact, as a business owner, you should accept that there’s never such thing as a good time to take one. Schedule your leave well in advance, let your staff know what’s going on and delegate responsibilities so that everything runs smoothly while you’re away. Then come back rested, refreshed and ready to lead them to prosperity. As you always have done. As you always will do. I've just had the opportunity to hear Ash speak for the first time at our daughter's schools Year 11 & 13 Presentation Evening & he certainly aced it. I'm sure the rest of the audience enjoyed Ash's words & both our daughters were talking about what he'd said on our journey home & quoting back what he'd said. If he's this good for 15-20 minutes I'm sure he'd be brilliant in an all-day workshop or training setting. Thanks Ash, you did great! "transformed the way that I think about my business"
I was lucky enough to work with Ash on a 1-2-1 coaching session and it was an afternoon that really transformed the way that I think about my business. Although in a 7-year-old business, I was only 4 months in myself, and working with Ash really focussed me. 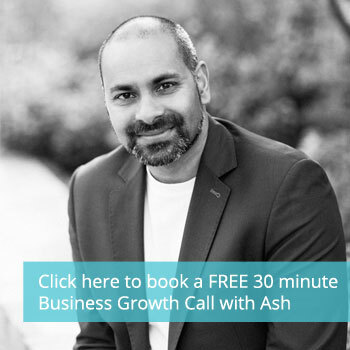 I'd never tried business coaching before, but Ash's approach is knowledgeable, passionate and firm enough to make you realise that the dream you want to reach really can become a reality. We have now set goals for our business that we really hold ourselves to and have a much clearer idea of what we can achieve. Thanks Ash and I look forward to working together again.